It’s a well-known fact that Spider-Man was born out of Stan Lee and Steve Ditko’s desire to create a more human superhero with everyday problems. Unfortunately for the Peter Parker seen in Spider-Man: Into the Spider-Verse, some of those problems have been rather debilitating. A new clip from the film reveals that prior to meeting Miles Morales, Peter has fallen on some pretty rough times. At this year’s New York Comic-Con, voice actor Jake Johnson explained that he was playing “Peter Parker at 40. It’s a Peter Parker who’s a little chubby and a Peter Parker who’s a little depressed.” This new collection of scenes provides us with context for the character’s low spirits. The clip specifies that the film’s version of Peter has worn the webs for more than two decades. However, recent events haven’t been very fortuitous for the friendly neighborhood Spider-Man. Peter dealt with Aunt May’s death and his divorce from Mary Jane. Whether he’s crying in the shower or eating pizza alone in his apartment, it’s clear that Peter’s life is no longer the great big bang-up it used to be. 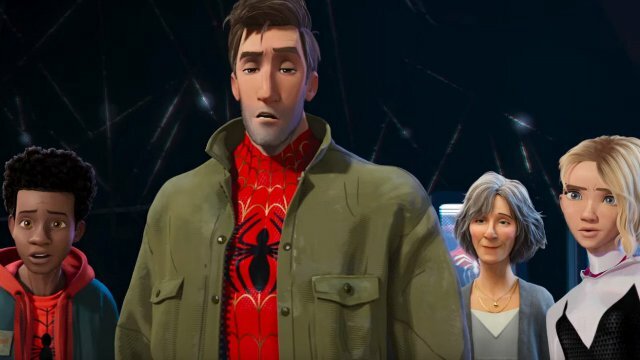 Because Into the Spider-Verse utilizes an older Peter Parker, its directors considered enlisting a familiar face to join the cast. Rodney Rothman recently told ScreenCrush that they almost asked the original movie Spidey, Tobey Maguire, to play the role. Although the part eventually went to Johnson, the film includes plenty of references to Sam Raimi’s Spider-Man trilogy. Previously released trailers have shown animated recreations of iconic scenes like the upside-down kiss from the original film and the train fight in its 2004 sequel. Most recently, a new TV spot featured a spoof of the infamous dance number in 2007’s Spider-Man 3. You can check out the new clip via ComicBook.com below. Based on what you’ve seen so far, what do you think of Johnson’s interpretation of Peter Parker? Give us your impressions in the comment section!